London boasts many weird and eclectic museums, but few more unlikely than a museum devoted exclusively to fans. That's right, the small semicircular pleated flappy objects that ladies used to wave before the days of aircon. A whole houseful of the things, open three days a week at the foot of Crooms Hill SE10 (opposite the Greenwich Theatre). I'd been meaning to visit for ages, but thought I'd better hang on until my Greenwich jamjar day arrived. Which it just did. Stuff the meridian, I had a date with my fans. The museum is based in a restored Georgian terraced house, which ought to have been hint enough to its diminuitive size. I walked into the first small room to pay my £4 to the girl behind the (rather elegant) desk, and accepted her offer of a guidebook consisting of photocopied sheets in a plastic wallet. It was only at this point I realised that the room in which I was standing formed half of the permanent exhibition. 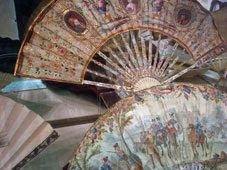 Eight or so exquisite fans hung from the walls, each beautifully painted or etched, although I'd have failed to appreciate them properly without the printed notes in front of me. Some were fans proper, while others were semicircular works of art not yet snipped, trimmed and folded. Once I'd grasped the concept that 18th century fans were merely handheld paintings for hot ladies, the rest of the collection made more sense. A second lower room explained, in appropriate detail, how fans were constructed and about the materials from which they were constructed. That was a lace fan, surely... blimey no, it was intricately carved ivory. Other special fans were assembled from tortoiseshell or mother of pearl or even, in one unusual case, Welsh slate. All the display cases had been mirrored to permit peeking at the underside of each exhibit, which was especially useful when one fan turned out to have an entire emergency sewing kit hidden away inside. All kinds of fans were on show in this minimal yet complete collection, even in the final cabinet a wall-mounted Vent-axia extractor. Explains why you so rarely see ladies fluttering fans today. Upstairs the museum puts on a thrice-yearly special exhibition, the theme of which (at the moment) is War & Peace. 18th century courtiers loved nothing better than to flap some noble battle scene in front of their face, especially if it featured pert soldiers in uniform or buff heroes from Greek myth. Commemorations of great victories were also de rigueur, even into the early 20th century, sometimes across broad pleated folds and sometimes in elaborate miniature. This was an impressive show of more than 200 fans, allegedly just the tip of the museums' in-storage iceberg, covering a broad perspective of eras and cultures. For greatest enjoyment it was crucial to read each accompanying label carefully, because somebody's gone to a heck of a lot of effort to write them. But that's the lot. There's a shop, of course, selling unusual fan-related gifts that certain female relatives might love come Christmas, although that didn't detain me for long. There's also an Orangery out the back where tea and cakes are served on Sunday and Tuesday afternoons, but which looked rather lonely on a nippy autumn Saturday. For more information, check out Londonist who are highlighting the Fan Museum as their museum of the month. And if you're ever in Greenwich accompanied by someone debonair and classy (not me, then), do consider taking them here rather than the usual tourist hotspots. 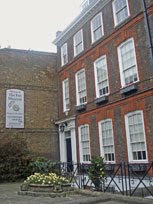 Down to Eltham, not to the Palace (been there, blogged that) but to visit E Nesbit's house. She's the prolific turn-of-the-century author who wrote The Railway Children, amongst many other things, and wrote it here in an old house on Well Hall Road. Edith's home no longer stands, having been demolished after a fire in 1926, after which the council set about transforming the surrounding land into an attractive set of gardens. And didn't they do well? An astonishing number of garden types and habitats have been crammed into thirteen urban acres. Part is wooded and part parklike, but other areas include sloping rockeries, ornamental flowerbeds and a bowling green. There are also two formal gardens, one sunken Italian, the other rather larger and laid out around a central fountain. Three holes in the western wall once housed Tudor bee skeps, unique in London, and the rosebushes must look a spectacular sight in the summer. But not in mid-October. The entire Pleasaunce was extremely quiet at the weekend (apart from the roar of passing Dover-bound traffic), attracting few visitors despite the allure of its assorted autumn colours. One woman pushing a well-wrapped toddler, two girls gossipping on a bench, one youth engaged in an important phone call, and me. Plus lots of squirrels, who know a good nut source when they see one. 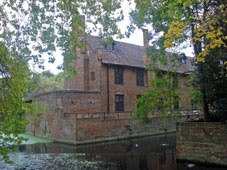 Rather busier was the moat-side Tudor Barn, a two-storey gabled outbuilding originally owned by Sir Thomas More's daughter. It's been many things in its time, notably a pub, but has relaunched this month as a cafe/brasserie/eventspace. I popped in to try it out (yes, welcoming, cosmopolitan, full) but didn't really have time to sit down for a bite. "Do you do take away?" I asked. That threw her. "Er, we can do," she replied, no doubt wondering why I'd want to take my hot chocolate outside with the squirrels when I could have stayed in with proper crockery. My drink was tepidly so-so, although another customer at the counter assured me that the late-opening Sunday roasts are great. The Tudor Barn's website is as yet unhelpfully information-light, but both Brockley Central and the Greenwich Phantom have eaten here recently and posted reviews. Me, I'd stick with the outdoor garden-wandering experience, which is absolutely more than pleasaunt.